Much of collecting revolves around putting together sets of related pieces, whether the items you are collecting are trading cards or, well, unproduced toy prototypes. Gus now happens to possess one of the most complete collections pertaining to Kenner's largely-unproduced Empire Strikes Back line of 12" figures. Not only does he have almost all of the box flats for these notorious figures, he has three of the four figures that were planned for the line extension but then cancelled prior to production. Here you see the Luke Bespin figure. It's dressed as you'd expect a Luke Bespin figure to be dressed-- in brownish fatigues. Take special note of the boots. 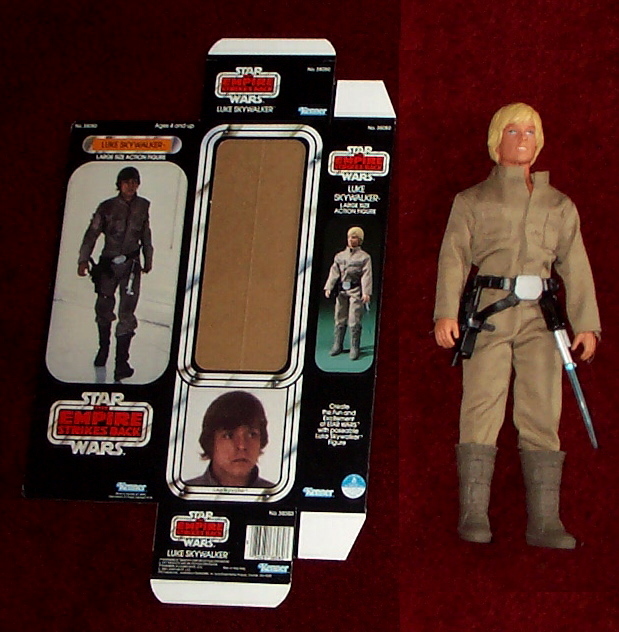 Although the belt that would have been packaged with this figure would have been drawn from the production Han Solo doll, its boots were specially created in imitation of the footwear Luke is seen wearing in the ESB film. These same boots were used on the prototypes of the Han Hoth doll, though they were molded in a different color. Early conceptual prototypes of this figure show it with somewhat cruder boots. The figure also would have come with a blue lightsaber.